Students perform a simple science experiment to learn how a rocket works and demonstrate Newton’s third law of motion. Students will predict the motion of a rocket, perform an experiment to verify and repeat the experiment to validate the results. Set up the experiment in an area where students can all gather around and see clearly but stand back far enough to not interfere with the balloon travel. Prior to class, cut out (and color, if desired) the rocket figure. When a rocket expels fuel or propellant out of its engine, the rocket moves in the opposite direction. The rocket pushes the propellant out, and the propellant then pushes the rocket. The propellant comes out of the engine. This is the action. The rocket lifts off the launch pad in the opposite direction. This is the reaction. In this activity, the rocket is a balloon propelled by air. Show students a video of a rocket launch. Note the direction that the rocket moves. Note where the engines are and where the flames or fire comes out. Ask students if they know how a rocket works. Explain to them that they will be conducting a simple demonstration or science experiment to show how a rocket lifts off the launch pad. Students, just like the astronauts in space and scientists on Earth, will conduct an experiment to gather information. Thread the fishing line through the straw, then attach each end of the line to the back of two classroom chairs. Pull the chairs apart to stretch the line tightly. Inflate a balloon and keep it tightly closed using fingers, a clothespin or a binder clip while carefully taping the balloon to the straw. Slide the balloon-straw assembly to the middle of the fishing line span. Show students the position of the balloon on the fishing line. Explain to the class that, in this experiment, an adult will release air from the balloon and students will predict what will happen. Introduce the word “hypothesis,” if appropriate. Show the class the word written on a piece of chart paper. For scientists, a hypothesis is a reasonable or good guess about what they think will happen in an experiment. Discuss the direction the air will move when it is released from the balloon. The balloon will also begin to move. Based on their prior experiences, ask the students to make a good guess about the direction the balloon will travel when air is released. Ask the class to verbalize their hypotheses, or guesses, about the movement of the balloon. 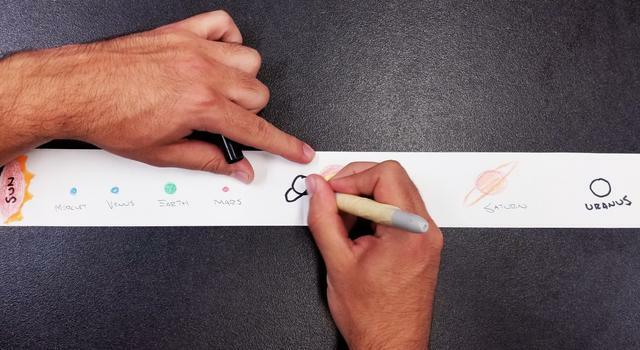 Have students point with their fingers to indicate the direction in which they think the rocket will travel. Write the hypothesis developed by the class on the chart paper. When discussing the direction of movement, encourage the class to use the word “opposite.” Introduce or review the concept of opposites. To help students remember the correct sequence of events in the experiment, write directions or draw pictures to represent the steps on chart paper. Display the directions in the classroom. Ask students which way, based on their hypotheses, we should tape the rocket figure to the balloon. If necessary, remind students that the nose cone of the rocket points in the direction the rocket will travel. Use cellophane tape to attach the rocket figure to the balloon. Prepare to launch, or release, the air from the balloon. Just like a rocket launch, practice a countdown, “10,9,8,7,6,5 ... ,” before the air is released. 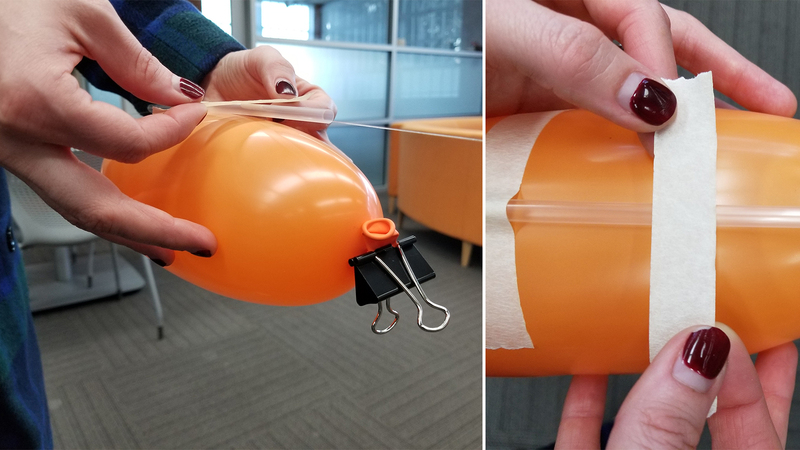 Carefully remove fingers, clothespin or binder clip from the balloon and release the air. The balloon will travel in the opposite direction from which the air escaped. Ask students if their guesses or hypotheses were correct. Explain to students that scientists must repeat an experiment many times. Repetition of an experiment ensures that the results are accurate. Like scientists, the class must repeat the experiment with the balloon to determine that the results are always the same. Let students choose a reasonable number of times to repeat the experiment. Scientists need to have many repetitions to increase the reliability of their results. Before repeating the experiment, tell the class that scientists need a method to record the results from experiments. Ask the class to devise a simple way to record information or data from the experiment. For example, if the experiment repeats five times, ask students to write the numerals 1 to 5 on an individual sheet of paper or in a journal. Have students observe the experiment being performed a number of. Have students draw an arrow next to the numeral to indicate the direction the balloon traveled each time. Be sure students are only on one side of the rocket so arrow directions are consistent. Data collection could also be a class activity. Be ready to repeat the experiment the number of times suggested by the class. If necessary, use a new balloon blown up by an adult. 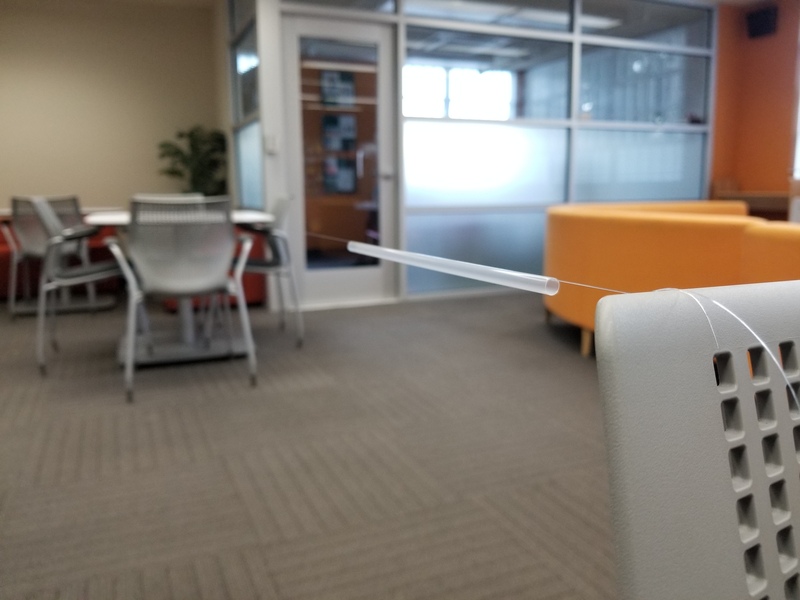 When attaching the balloon to the straw, be certain that the open end of the balloon is always facing the same direction. Remember to practice a countdown. Collect data from the experiment. As the experiment repeats, let students participate by holding the balloon closed and releasing the air. Remind the class to observe the balloon’s movement and to record the data. Allow students to compare their data. Ask students if they can learn something or draw a conclusion from this information. Discuss whether the original hypothesis or guess was correct. Have students verbalize why they think the balloon traveled in the opposite direction. Explain to students why the movement of the balloon is like a real rocket’s movement. If appropriate, introduce Newton’s third law of motion. In a rocket, propellant escapes from the bottom of the rocket. In the balloon experiment, air escapes from the end of the balloon. The balloon moves due to the escaping air providing a “push” to the balloon the same way a rocket lifts off due to the escaping propellant providing a “push” to the rocket. Also like a rocket, the balloon travels in the opposite direction of the escaping air. Display the chart paper with the hypothesis, the chart paper with the conclusion, and the data collection sheets in the room. If a camera is available, add pictures of the students conducting the experiment to the display. Observe students as they answer questions about the experiment. Have students draw a picture of the experiment in their journals or on a piece of paper. Ask them to explain their drawing and explain the relationship between the balloon’s movement and the released air. Ask students to describe how a rocket works. 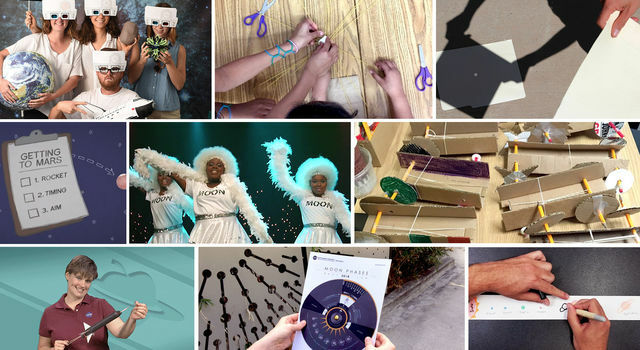 Challenge students to apply what they learned in this experiment. Repeat the experiment with one change. When attaching a balloon to the straw, reverse the placement of the open end of the balloon. If the open end was to the left, place it to the right. Ask students to form a hypothesis about the movement of the balloon when the air releases. Conduct the experiment. Repeat if necessary. Discuss whether the hypothesis was correct. Talk about the similarities and differences in this experiment and the original experiment. Ask the students if the balloon, in both experiments, moved in the opposite direction from the release of the air. Discuss how students applied what they learned or their conclusion from the first experiment to a new situation. Repeat the experiment with another variation. Change the position of the fishing line. Attach one end to the ceiling. Place the straw on the line and stretch the line tightly. Attach the balloon. Attach the other end of the line to a chair or object in the room. Repeat the experiment. Ask students to apply what they learned to a new situation. In a journal or on a sheet of paper, or as a group exercise with the teacher writing on chart paper, ask students to list the steps needed to conduct the experiment. Discuss the importance of completing the steps in the right order. Encourage the use of ordinal numbers, such as first, second and third in students’ descriptions. Have students use directional words to describe the movement in the balloon experiment or a rocket launch. Discuss words such as up and down, left and right, and forward and backward. Introduce or review the concept of words that are opposites. Have students generate a list of words that are opposites. Locate books that feature pictures and drawings of rocket launches. Encourage students to look at the depictions of rocket launches and think about what they now know about how a rocket works. Ask students to look at the pictures and note the direction in which the rockets move.